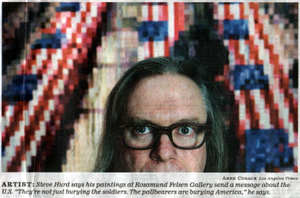 A great article was just published in the LA Times about Steve Hurd, and his upcoming show at Rosmaund Felson Gallery. Pictured above is Hurd wearing his Hitch frame in tortoise on black and standing in front of one of his R.I.P. paintings. Hop over to the LA Times where you can read the entire story!